Prepare to be challenged by anime girls whose bullets speak louder than their snarky dialogue in Azure Reflections. 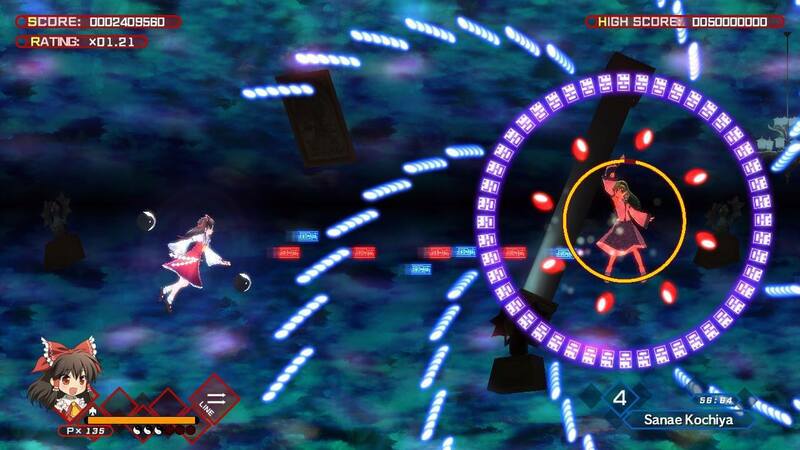 The Touhou Project recently reached its twenty-year anniversary and keeps the tradition going with the release of Azure Reflections. Always known for cute and manic gameplay, the project sees the same girls throughout the genre-spanning series fighting against each other in battles (sometimes physically, as there are some fighting games), but mostly through manic bouts of colorful bullet patterns. Azure Reflections, amazingly enough, is a remake of a PC fan-game from 2012 called Maihana Soumakyou: Uniting Barrage Action that updates the original for modern consoles. 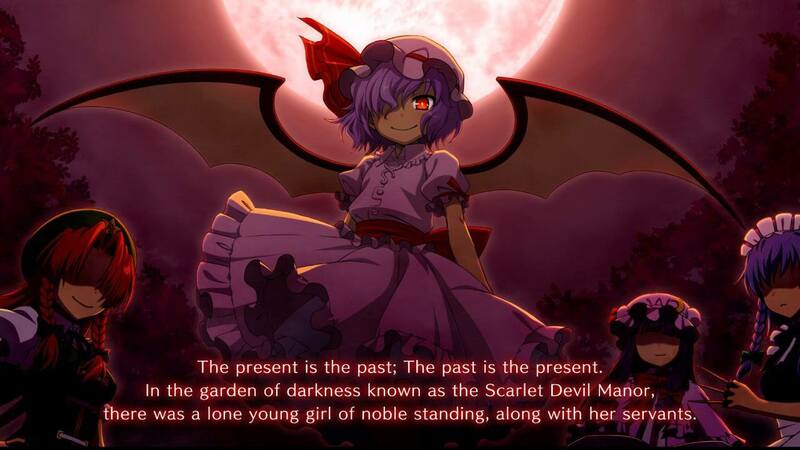 The girls in the Touhou games have always been at the forefront of the story and Azure Reflections is no exception. You play as the happy-go-lucky protagonist Reimu Hakurei and go looking for her friend Marisa, who went on an errand but never came back. On Reimu’s journey to find her, she notices that the lake that she is flying over has scarlet-colored fog above it and is reminded of the Scarlet Mist Incident, a doomsday scenario from the annals of history where the entire planet was covered in the same blood-red mist. She decides to immediately head towards the Scarlet Devil Manor to find answers. 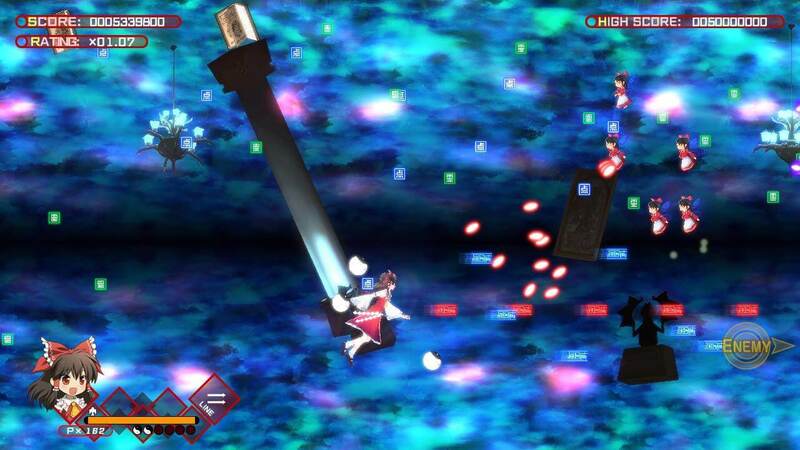 Gameplay in Azure Reflections is a bit different from the traditional top-down vertical shooters that make up the core Touhou series in that it is a horizontal bullet-hell game. Small enemies come from both sides of the screen (indicated before they arrive with an arrow) and fire bullets or merely try to run into you. Typically, in each level, there are only four different types of enemies aside from the boss herself, but with each bullet proving to be potentially deadly, you have to always be on your guard — regardless of how small the foe attacking you is. The varied enemies and scrolling environments all match perfectly to the stage’s theme, which ultimately represents the boss herself. A nice feature is the optional tutorial at the beginning of the game, which veterans of the genre (such as myself) can skip, but there are a few mechanics you would be wise to commit to memory to ensure your survival through the brutal curtains of fire from your enemies. You can control your character with the left stick or D-pad, which is nothing abnormal, but since dodging bullets can prove to be relatively cumbersome, you also have the ability to slow your movement while holding either the ‘L’ or ‘-’ button. This is almost a required tactic to utilize when the entire screen is blanketed in bullets. Thankfully, instead of your entire character being susceptible to damage, a small heart represents her hitbox and is relatively small. 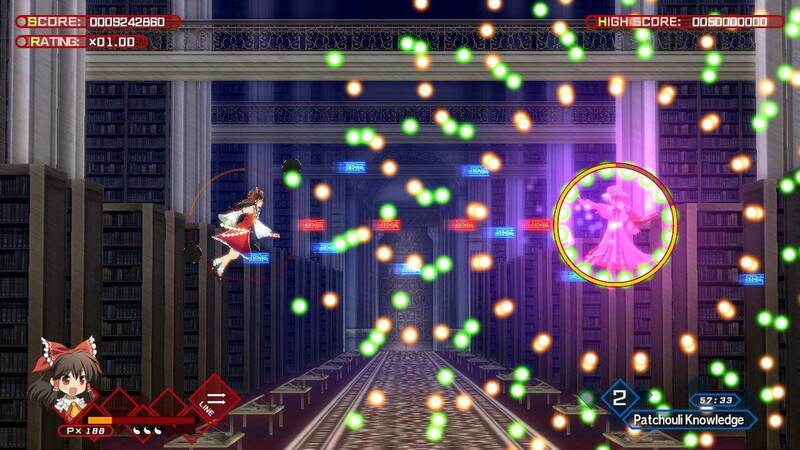 You can also fire left or right (regardless of which way you are shooting), use a barrier to protect yourself (and absorb bullets, which lets you pull off a devastating Danmaku Rush attack where you slam into enemies) and use Spell Cards. Spells cards are a different gameplay mechanic all by themselves because they can convert all bullets on the screen into point items (which you can collect, as expected, for more points) and save you from death if you are simply overwhelmed. If you play these while a boss is using a spell card of her own, you will no longer be able to capture their spell card (and subsequently use it in other stages or against other bosses). You need the bosses’ cards to be able to fully complete the game, so it’s a tough give-and-take situation and really adds some additional pressure to an already difficult fight. One of the other things you gain during gameplay is green spirit signs, which are dropped by defeated enemies and bosses. You can use these items as a currency to buy cute accessories for your character. These are not merely cosmetic additions, however, as each one can add helpful traits, such as additional lives. Unfortunately, Azure Reflections does a bad job of handling these upgrades and instead of allowing you to purchase them between levels, you have to backtrack all the way to the main menu, essentially ending your ‘run’ to do so. It’s an inconvenience, but it doesn’t really detract too much from the overall gameplay, as the accessories are mostly bonuses for you to experiment with. The other girls in Azure Reflections serve as the bosses. They each have their own personality and tend to deliver lengthy monologues filled with silly banter before each fight. As per usual for this genre, the fight begins relatively easy and ramps up as you continue to do damage to the boss. It’s working through all the bullets while still holding your own shoot button and using your shield to power up your Danmaku Rush that really gets your fingers in a twist and even distracts from the ultimate goal of pattern recognition. Fans of the genre will find new patterns and waves of bullets to appreciate but for a newcomer, this might be the point where you set the controller down. Thankfully, Azure Reflections is relatively short. That may not seem like something to put in the pro column, but with each stage only taking minutes (the entire game takes a couple of hours to beat), and with the difficulty being so challenging, it gives plenty of opportunity to try different accessories or spell cards and go back at it again. Sure, it’ll repeat the seemingly endless dialogue between the girls, but they are skippable and don’t really distract too much once you get the habit of mashing the ‘-’ button. Also, once you get ‘game over’, there is no continuing where you left off — you must start over from the beginning — so having shorter levels really makes it a less painful learning process overall. The art used in Azure Reflections’ cutscenes is gorgeous, while the art during gameplay is not quite as sharp. During cutscenes, you get to watch the girls act through facial expressions and subtle gestures, but the art is crisp and clean, as if it was ripped right from an anime. While playing the game, however, it uses 3D models — most of the models themselves are low-poly and while the textures and animations are clear enough, it would have been a lot cleaner in regards to the visuals for them to have used sprite animation. Enemy designs seem repetitive and uninspired and honestly, I had a tough time figuring out what some of them even were supposed to represent. I think most of the visual development was put into the cutscenes and bullet patterns, but I would have loved to see more detail in the on-screen characters during play. At the end of the day, Azure Reflections is a good entry in the series. 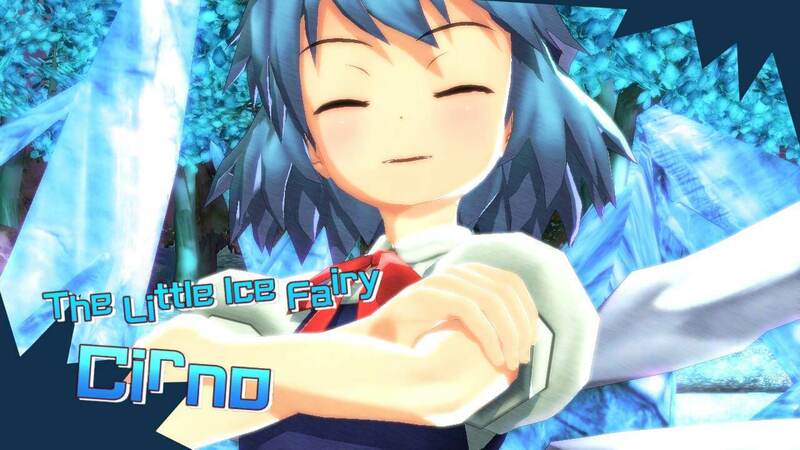 It accomplishes what it set out to do — offer cute anime girls with funny dialogues who try to kill each other — and does it with some new gameplay tricks that aren’t standard in most action shoot-’em-up games such as these. I would recommend it to any fan of the series, and with the tutorial and ‘easy’ modes included in the game, I would say it’s a good starting point for a newcomer, too. Azure Reflections was reviewed for the Nintendo Switch. It is also available on the Playstation 4.